The brand new release Aicok Centrifugal Juice Extractor is both easy on the eyes with a sleek and professional modern design and very functional with great new user-friendly features. It is already a popular product with quite a few reviews and an average rating of 4.8 out of 5 stars. 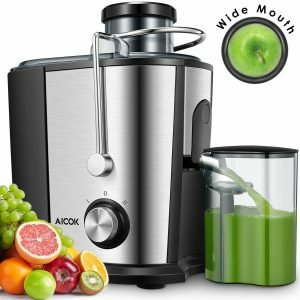 Aicok Juicer has a 3 inch extra wide chute for you to fit in whole fruits without needing to cut or peel. The exterior is mostly food-grade BPA-free stainless steel. It offers two speeds you can select through the dial on the side. And you have the anti-drip function for fruits and veggies. 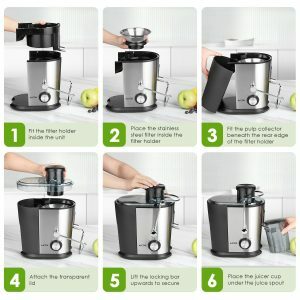 The 400-watt centrifugal motor is quite powerful but the juicer is also quiet with a noise level of only 60 decibels, which makes it quieter than other juicers. It is a fast and powerful centrifugal juicer that can make 15 ounces of juice from whole fruits in less than ten seconds. You won’t need to make much effort for preparing the fruits and for cleaning after you’re done with juicing. There will be very little foaming and no blocking. They’re all nicely processed with a sharp stainless steel cutting disc and an Italian micro mesh filter to give you up to 40% more minerals and vitamins and up to 30% more juice. The two-speed option is for different types of fruits and veggies. Please do not keep it on for more than 60 seconds at a time and if you did, please let it rest for a couple of minutes before turning it on again. As you can guess, the fast speed is for the tougher or harder to process ingredients like green leafy veggies, beetroot, carrot, celery at 15 to 18,000rpm per minute and the lower speeds between 12 an 15,000rpm per minute is for softer things like tomatoes, oranges, apples, pears, grapes, melon and more. This way you get more juice out of different produce. With the anti-drip feature the juice won’t come out when you don’t want it- when there is no cup underneath and not make a mess. The unit will not work until the security locking arm ensures the cover locks on tightly. It will be turned off by the Overload Protection System when the motor is overheated, in case of idle run, improper assembly and not so stable power supply. In the box you’ll get the main centrifugal juicer, a juice jug, a push rod, a residue barrel, a 3-inch feeder chute, a food grade materials juice outlet, a 304 stainless precision filter, a cleaning brush and an instructions manual. It weighs only 3 pounds and measures 11.6 x 8 x 12.3 inches- will occupy a bit of space on your kitchen counter. Please note that the plastic parts and other accessories should be washed by hand and not in the dishwasher due to the high temperatures in the dishwasher. It is very sturdy and durable, looks good in stainless steel and black, does the job well, quickly and quietly, is easy to clean and reinstall and is not cheap but costs much lower than a Vitamix Juicer. Please follow the instructions on the product page for assembly and operation. The warranty offered on this unit is three years by the manufacturer as a proof of its decent build quality and there is a helpful customer support team available 24 hours and 7 days a week.